Review date: 7 June 2002. 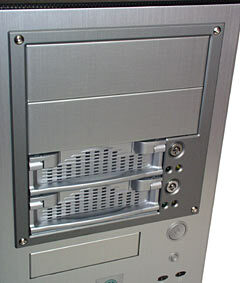 Removable hard drive racks aren't something that most computer users need, but they come in very handy in some situations. We're not talking about fancy serious-server gear here; no hot-swap, no hot-spare, no serried ranks of racks in giant refrigerator cases serving vast slabs of data to multitudes of users. Just basic racks. Simple lockable caddy arrangements, which you have to power down to insert or remove. With a carry-handle that unplugs the caddy when you fold it out. Also, almost always, with a key-lock. 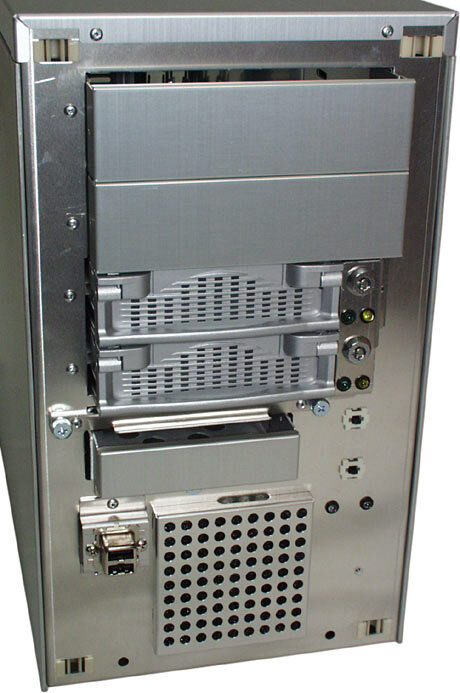 Use these sorts of drive racks, and you can tote around huge amounts of data without spending a huge amount of money or time on your transfer medium, which is what you'll have to do if you want to use tape or CD/DVD burners or disk cartridges. You can physically lock away valuable data at the end of the work day. You can physically swap a computer's boot drive for a new one in ten seconds, and thereby make it impossible for other family members to scribble all over your work data. You can swap out a whole RAID array when you want to switch your video editing system over from Unfinished Job A to Unfinished Job B. And so on. 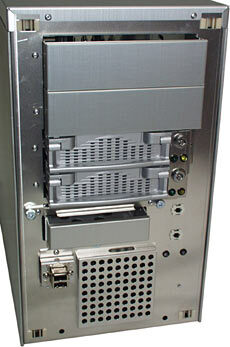 A lot of consumer hard drive racks are pretty cheaply made, though. Plastic-framed racks can work perfectly well, as long as they've got decent quality connectors. 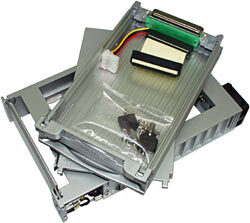 But a plastic rack will thermally insulate the drive somewhat, which can cause overheating problems. A lot of plastic racks have one or more dinky 40mm fans built in to help with this, but the fans often don't help as much as you'd hope. Most drive racks are also not very pretty. From a utilitarian standpoint this matters not at all, of course. But if you want your computer dressed to impress - because it's visible to clients of your business, or just because you're a show-off - then boring beige with a little red light probably isn't quite what you're after. Let's assume you want a compact PC with a couple of drive racks in it, and you want it to look good, and you wouldn't mind if it was smaller than the average computer, either. The new PC-39 is a result of Lian Li's policy of expanding their range of cases into odd market niches. 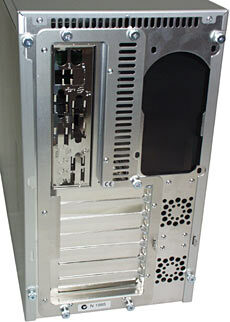 It's a good-looking small form factor case with a pair of drive racks factory installed. Drive racks normally mount in a 5.25 inch bay, but these ones are integrated into the case so that they take up a spot that'd otherwise be used for a pair of 3.5 inch bays. Hence, despite the PC-39's small size, it still has room for 5.25 inch devices. 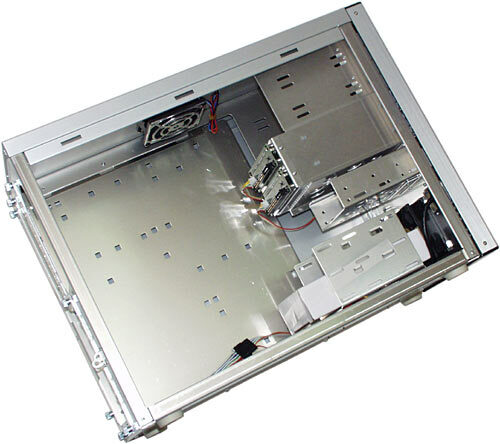 The PC-39 is an aluminium case, of course; Lian Li don't make cases out of anything else. It's got Lian Li's trademark hard anodised brushed metal finish. Looks good, quite hard wearing, not too susceptible to finger-marks. The fronts of the two racks match the aluminium front panel well, but they're not actually metal; they're plastic. The main part of each rack tray, where you install the drive, is aluminium, so the drive should get decent cooling. The racks are both lockable. The PC-39 has two 5.25 inch bays and six 3.5 inch, including the two racks. The 5.25 inch bays and one of the 3.5s are "external", with a front panel hole. The case is 210mm wide by 357mm high, but like some other small Lian Li boxes (including the PC-31, reviewed here), it's unusually deep; 455mm. This gives the PC-39 enough room for normal ATX motherboards; you're not restricted to microATX or FlexATX boards. The down side of all Lian Lis is that they're not cheap, compared with practically any case made out of steel. The PC-39 is $AU462 from Aus PC Market here in Australia. That price includes delivery in the Sydney metropolitan area, but doesn't include a power supply. As usual for Lian Li cases, this one has respectable ventilation. There's only one 80mm fan lurking behind the grille at the bottom of the front panel rather than the usual two, but it's likely to be enough. There are also two USB 2.0-compliant front panel USB ports, which you can hook up to a motherboard that's got headers to match by using a couple of Lian Li's usual modular many-small-connector plugs. Figuring out where to put the plug parts on your motherboard USB header may be slightly tricky, but the plugs are labelled, and there's a decent chance your motherboard manual will reveal what USB connector pinout it uses. Pop off the front panel (the PC-39 has the same no-rattle easy-remove clip arrangement as every other current Lian Li), and you can see what's there, and what isn't. What isn't is a speed control switch for the front fan, which the fancier Lian Lis all have. The front fan connects, inside, with a simple passthrough four pin adapter, and it'll run at full power all the time unless you use your own speed controller. There are still various other Lian Li convenience features, though. The single external 3.5 inch bay can be removed from the case for easy drive installation, after you undo a couple of thumbscrews. As is usual for Lian Li cases, all of the stuff you're likely to have to remove is held in with thumbscrews. The drive bay covers are the standard Lian Li click-in type; you don't need a screwdriver to remove them, but they don't rattle. There are, of course, no nasty partially punched panel blanks behind them that can only be elegantly removed with... with some tool that I don't have. Cheap cases commonly have these blanks behind all but a couple of their bay covers. 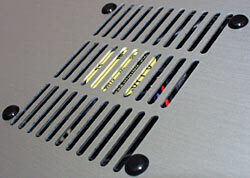 There PC-39 front panel also has a slide-release metal cover for the intake fan filter. The filter will need cleaning after a few months of operation in a normal environment. There's an 80mm exhaust fan in the middle of the PC-39's top panel; Lian Li have been adding these to a lot of their cases lately. The neat little press-lock plastic buttons that hold the fan in place will make it dead easy to swap it for a more powerful model, if the urge strikes you. 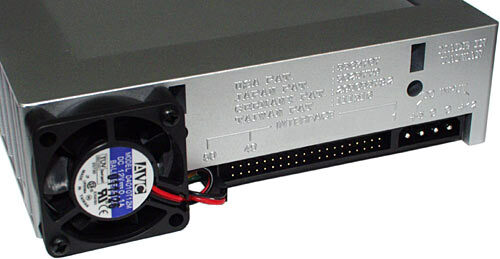 The PC-39's back panel is typical tiny-Lian-Li; vertical PSU mount spot (with no reversible mounting plate, so you should make sure you don't pick a weird PSU with a fan on the wrong side), removable motherboard tray (which makes this small case easier to work on than many larger ones), two 40mm fan mount spots (which you might as well leave empty; 40mm fans move very little air), and yet more shiny thumbscrews. Inside, the PC-39 has typical Lian Li layout. The three internal 3.5 inch bays are in a removable cradle that sits behind the front cooling fan. There's also a connector in the middle of the motherboard-plugs cable, so you can more slide the motherboard out of an assembled computer without having to unplug and replug all of those fiddly little light and switch connectors. 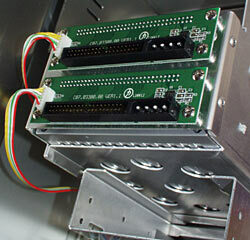 The backs of the PC-39 rack cradles have normal ATA and power sockets; you plug them in like any other drive. The cable on the side of each rack goes to its front panel switch and lights. When the racks are unlocked, they're off, and the drive might as well be unplugged as far as the computer's concerned. ...are the stand-alone versions, in silver and black respectively. 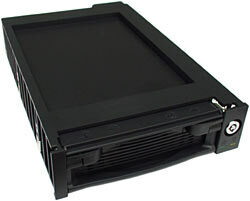 They use the usual 5.25 inch bay mounting method, because you couldn't get the PC-39's version of the rack frame into a normal case without some surgery. Aus PC Market sells each of them for $AU88, including Australian delivery. 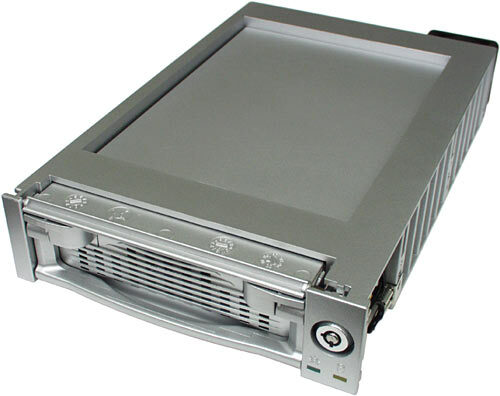 Each of these racks has a single slimline 40mm exhaust fan, which along with the aluminium mounting tray should be perfectly adequate for cooling 7200RPM IDE drives. 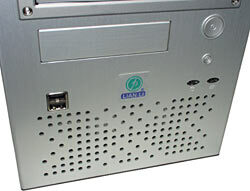 Again, the back panel connectors are dead simple, as is normal for basic IDE drive racks. 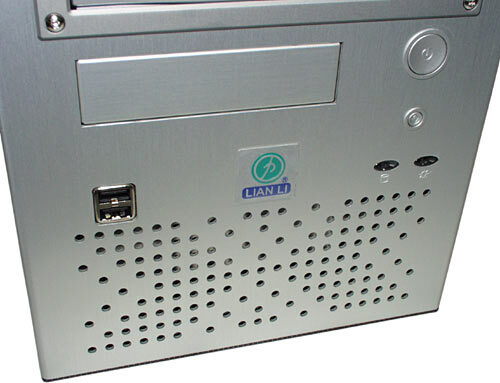 The RH-321 is easy to get into - as are the PC-39 racks. 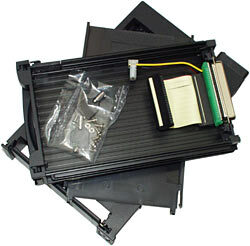 You slide off the plastic top of the drive cradle by pulling on one little clip thing on the side, and you get drive mounting screws as well as a couple of keys with the rack. These racks are supposed to work fine with drives all the way up to Ultra DMA/133 spec; the stubby little cable inside has the UDMA/66+ 80 wire configuration. Adding another contact point and a circuit board to the data path in the faster UDMA modes, though, could possibly push an already dodgy storage subsystem over the edge into occasional uncorrected data errors. For peace of mind, I'd use the motherboard's BIOS setup to restrict faster drives to UDMA/66, or even UDMA/33. The real performance loss from doing this is likely to be very small, as even the fastest IDE drives are, by themselves, only now barely managing to saturate UDMA/66 bandwidth for sustained transfers. The RH-322 comes apart in the same way as the RH-321. But it is, of course, funkier. You can put together an OK case with a couple of drive racks and a decent PSU for quite a lot less than the PC-39 costs. It won't have as many 3.5 inch bays, but you can probably live with that. It won't look as cool, either, but there's a good chance you won't care. It won't be as easy to work on, but if you're not prone to diving into your PC twice a week, that's not a terribly big deal either. 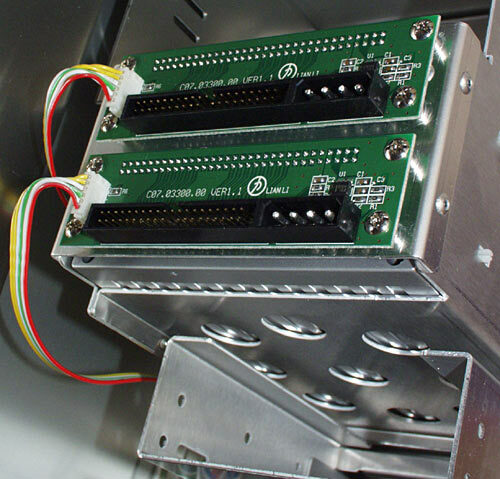 Similarly, you can get drive racks that do the same thing as the RH-32x pair for less. Not a huge amount less, but then these two racks aren't all-aluminium. Black and silver drive racks are, however, tricky to find; the RH-321 and 322 thus have a definite niche. If you want a drive rack to match your natty non-beige case, here a couple are. People who buy Lian Li cases aren't doing it because of a careful financial analysis. They're doing it because these cases are significantly superior in a number of areas, not the least of which is appearance, and because the price premium really isn't that horrible compared with the price of the gear that's going in the case. 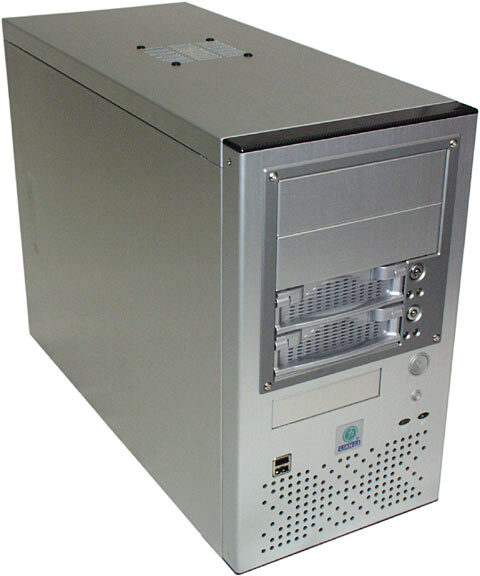 The market for cases with twin standard drive racks is, of course, pretty small. But if you're in that market, you should definitely check the PC-39 out. It's well made, it's well thought out, and it looks great too.